Goblin Lee's Miniatures Blog. : Rogue Trader Ork Dreadnought pilot, taking a break. Rogue Trader Ork Dreadnought pilot, taking a break. I've been painting a lot more Rogue Trader Orks, but more of those in other updates. For now, here is a conversion of an Ork Dreadnought. 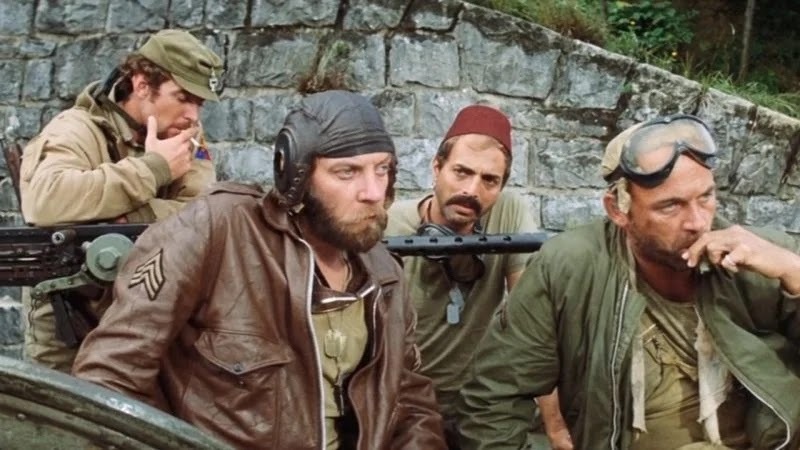 I have always loved the film 'Kelly Heroes', and Oddball's tank crews in particular. One of the crew, known as 'Turk', amused me. It must have been the fez, as I like fez's. So I converted an old solid based Orc crewman from Citadel's Arcane Monstrosities TA4 Orc War Machine. It was a simple conversion, bending the arms, and adding a green stuff fez and cigar. The Dreadnought was painted in a rusy style, with Citadel's Typus Corrosion, Ryza Rust, and Runefang Steel. And so there you have it. A chilling out Ork pilot, taking a break somewhere on Rynn's World. I do love how Citadels Technical Paints turn out. I am not sure the Fez looks as tidy as a real fez, but could always be more of a smoking hat instead. Next will be more Rogue Trader Space Orks! Thank you, I always loved the cultural references in 1980's Games Workshop, and also when people added their own to their miniatures. Some of the old 'eavy Metal photographs have some fun references which people have made. Kellys Heroes started me out on my life long love affair of Tiger tanks, yes I know now it was just a T34 in drag, but when I was under 10 my Corgi Tiger and I fought many a carpet battle. This is the long lost coolness Games Workship is desperately seeking (by just re-releasing retro units) and will never find back. Awesome work! You're right, GW is looking back at a lot of it's old background and design concepts to capture some of the old magic. It's nice that they are trying to, and it's good to see it, but I think they are constrained by what they can do now. I think it's up to gamers/collectors to pcik up where they left off and are leading. Thank you, it was a bit of fun and enjoyable to do. I was reading the old Rogue Trader rules for the Ork Dreadnoughts and they said (to paraphrase) that Orks, being Orks, are quite free with the weapons they use on their Dreanoughts. This is catered for in the Dreadnought option rules. So, as the Heavy Plasma Gun is used by Orks, and is on one of the diagrams of Dreadnoughts, I thought why not? I took pains to use the 'correct' older style design of Heavy Plasma Gun too. Thank you. I like your Orks in Power Armour, and Skaven too.